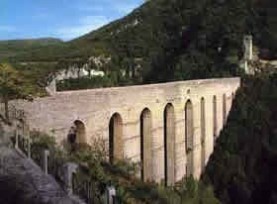 The Ponte delle Torri of Spoleto is 236 m long and 90 m high. It is a huge ten-arcade work that connects Colle Sant' Elia with Monteluco. It is constituted of a road and a water canal supported by ogival arcades and stone pillars. It can be reached after a long fine-view walk around the Rocca. The Fortilizio dei Mulini and the Basilic of St. Peter can be visited while crossing the bridge. The historians have not come to a satisfactory agreement about its exact date of construction, yet. Some of them say it was built in the XIII century, probably over the remains of an ancient Roman aqueduct. The bridge preserved the function of the previous structure to carry the water of the Cortaccione springs to Spoleto. Nevertheless, many think its origins more probably date to the XIV century. At that time, the cardinal Albornoz started its construction works entrusting Matteo Gattaponi with this task. Yet, its quite late-medieval characteristics, since its origin date to before the XIII century (as testified by its central Romanesque pillars), and the absence of any cardinal's symbols on the bridge, mean that this structure was built before Albornoz. It is certainly acquainted that the name "pons inter torres" was given to it around the XVIII century because of the towers standing at its sides, one on the Fortilizio dei Mulini and the other near the Rocca Albornoziana. Yet, the question of the name is being much debated on, since some scholars think that its name derived from the big stone pillars the bridge lies on. In effect, its two central pillars are hollow on the inside and they have entrance doors. This means that they definitely were well-defended towers. As a matter of fact, the Ponte had a remarkable strategic position, since it overlooked a vast area and was connected to the Rocca. What is certain is that the Ponte delle Torri gives the chance to enjoy a very appreciated panoramic view over one of the greenest and purest areas in the territory of the Preappenines, near Spoleto. Without doubt, this view impressed Wolfgang Goethe, too. The XVIII-century German writer and dramatist dedicated one page of his "Viaggio in Italia" to this bridge. An ornamental plaque near the bridge commemorates his promenade throughout the city.